Bode Miller: Elegance Among the Turmoil A rebellious guy hurtling downhill on one plank rather than two, giving spectators an unpredictable, acrobatic show. Hey Bode Miller, maybe you missed your calling. Maybe you should have been a snowboarder. 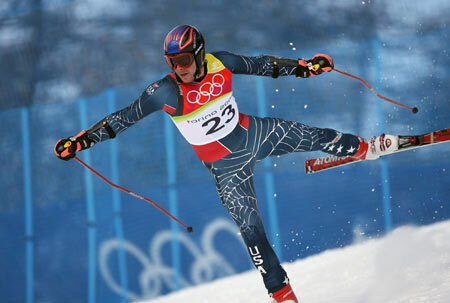 Bode Miller struggles to keep his balance after colliding with a gate in the men's Super G, Feb. 18, 2006. After all the buildup, the Nike commercials, the 60 Minutes profile and the Time magazine cover, skier Bode Miller hasn't come close to winning a medal in three events at the Winter Olympics. In two, the combined and the Super G, Miller didn't even finish the race. Let's not debate here if Miller is the creation of an overheated hype machine or if he's a great skier who suffered through a few bad races at just the wrong time. Here's one thing to say in defense of Bode Miller. He can look spectacular even when he's veering off course and getting himself disqualified. In Saturday's Super G, he rammed into a gate about midway through the race. The collision sent him flying in the air with his skis splayed awkwardly. Landing with his right ski heading down hill and his left ski in the air pointing in the other direction, he looked like a wishbone about to be snapped. For several breathtaking seconds, he balanced on that right ski, gliding gracefully, until he managed to swing the other leg around and get his skis parallel. No victory, but also no catastrophic injury, and a brief moment of great theater. Last year during the Alpine World Championships in Italy, Miller lost a ski on a downhill run. Instead of stopping, he went down most of the course on the one ski. A few times he dipped into the tuck position. The delirious crowd went wild. If you follow skiing even a little bit, you have seen the replay. Is there a pattern here? A rebellious guy hurtling downhill on one plank rather than two, giving spectators an unpredictable, acrobatic show. Hey Bode Miller, maybe you missed your calling. Maybe you should have been a snowboarder.